Definitions and variables Mathcad’s power and versatility quickly become apparent once you begin to use variables and functions. By defining variables and functions, you can link equations together and use intermediate results in further calculations. The following examples show how to define and use several variables. • Type the variable name to be defined. • Type the colon key to insert the definition symbol. • Type the value to be assigned to the variable. The value can be a single number, as in the example shown here, or a more complicated combination of numbers and previously defined variables. 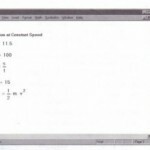 Mathcad worksheets read from top to bottom and left to right. Once you have defined a variable like t, you can compute with it anywhere below and to the right of the equation that defines it. Now enter another definition. • Press [.J]. This moves the crosshair below the first equation.• To define ace as -9.8, type: acc: -9.8. Then press [.J] again. Figure 1-2 shows the two definitions you just entered. Now that the variables ace and t are defined, you can use them in other expressions. • Click the mouse a few lines below the two definitions (see Figure 1-2). • Type acc/2[Space]*t”2. The caret symbol (“) represents raising to a power, the asterisk (*) is multiplication, and the slash (I) represents division. the lOon your screen and change it to some other number, Mathcad changes the result ;s soon as you press [..1] or click outside of the equation.